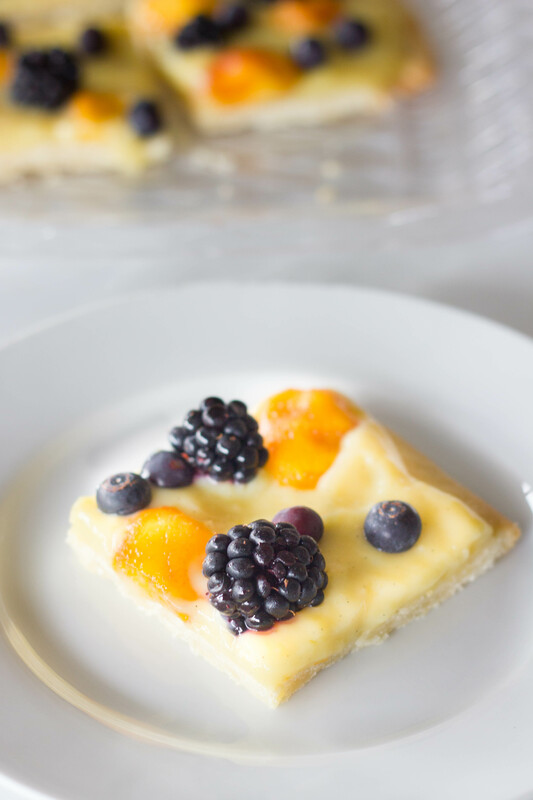 This is Fruit Flan, not to be confused with dessert pizza or classic Spanish flan. To be honest, it’s really just a fruit tart with a fancy name, but there’s nothing fancy or hard about making this dessert. It starts with a cream cheese pastry crust – 4 ingredients, pulsed in the food processor, rolled thin, and baked until golden brown. Then, you whip up an easy vanilla bean pastry cream. Top it off with whatever fruit fruit you have laying around and you have one of the best desserts I’ve made this summer! Give it a try and let me know what you think. Enjoy! 1. Combine all ingredients in food processor. Pulse until just combined. 2. Roll ~1/4″ thin on lightly floured parchment paper- any shape you want. I rolled mine about 12 inches by 7-8 inches. 3. Bake at 350 degrees until golden brown, about 15 minutes. Cool completely. 1. Combine milk, flour, egg yolk, and sugar in medium saucepan. Whisk to combine. 2. Cook over medium heat until thickened. Remove form heat and stir in vanilla bean paste and butter. Whisk until combined. 3. Cover with plastic wrap (directly on top of the pastry cream so it does not form a film). Place in fridge to cool completely. 1. Spread pastry cream evenly over cooled crust. 2. Top with any fruit you like – blueberries, blackberries, peaches, strawberries, etc. Store leftovers in the fridge.